First edition of this essential document of architectural literature. Octavo, original gray cloth, illustrated. Signed by both Robert Venturi and Vincent Scully on the title page. Scully contributed the introduction to this volume. Fine in a near fine dust jacket with a touch of shelfwear. 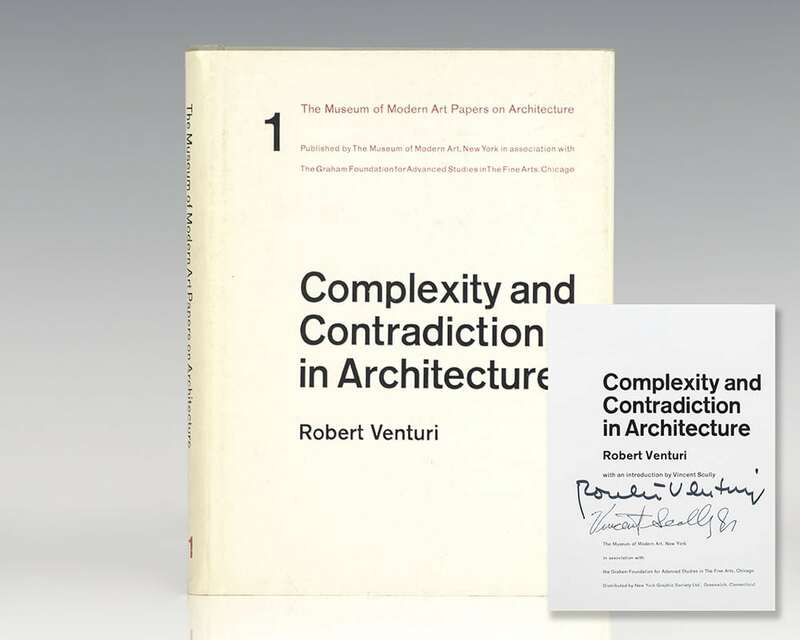 As Venturi's "gentle manifesto for a nonstraightforward architecture," Complexity and Contradiction in Architecture expresses in the most compelling and original terms the postmodern rebellion against the purism of modernism. Three hundred and fifty architectural photographs serve as historical comparisons and illuminate the author's ideas on creating and experiencing architecture" (The New York Times). First edition of this essential document of architectural literature. Octavo, original gray cloth, illustrated. 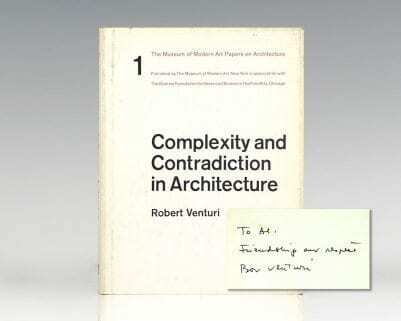 Signed and dated by Robert Venturi on the title page. 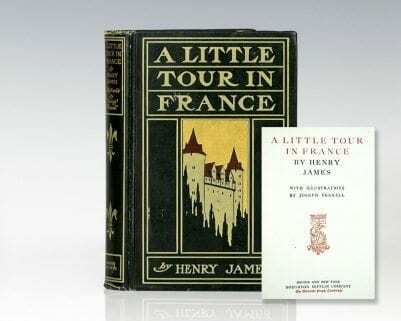 Fine in a near fine dust jacket with a touch of shelfwear. Farmholme Guest Book: With Drawing by Addison Mizner. Quarto, bound in full green morocco, gilt titles and tooling to the spine, all edges gilt. With original caricature and artwork by architect Addison Mizner. Entries dated between 1906 and 1929 and about two-thirds of the leaves remaining blank. 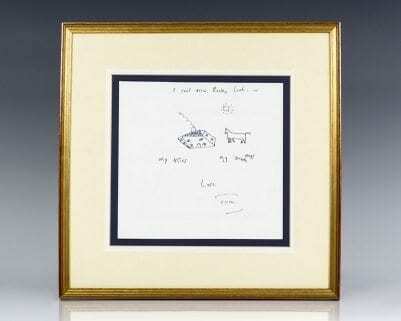 Mizner’s contributions include to the guestbook include three self-caricature sketches and also a watercolor, each signed by Mizner. Besides Mizner’s contributions, there are two other watercolors, one a cameo of a bucolic classical ruin, another, a dog looking out onto a panoramic view of pines and the coast, undoubtedly a view from a Farmholme prospect, or nearby, before it was overrun with suburban development. And there are several other fun drawings, including ones of a race car and of a plane. Mizner is credited with pioneering the Mediterranean and Spanish Colonial stucco architectural style in Southern Florida, and also Southern California and Beverly Hills. As virtually integral as this style has become to these places and elsewhere, before Mizner designed the Everglades Country Club’s clubhouse in Palm Beach in 1918, the prevailing style there was Victorian Queen Anne and Colonial Revival shingle homes such as one would have found in Northeastern resorts. Admiration for the Everglades clubhouse made Mizner the go-to architect for millionaires who competed against one another through the 1920s for the most impressive mansion in Palm Beach, formerly primarily a hotel resort, and his style was emulated by other architects hired to build less august developments. Among his legacy is the Boca Raton Resort & Club. Mizner, though, was not your typical nose-to-the-grindstone architect but also a highly colorful figure, famed as a raconteur, a co-author of the satiric “The Cynic’s Calendar of Revised Wisdom for 1903” and many sequels, and a bit of a scoundrel, who with his brother was implicated in some shady transactions relating to the Florida land boom of the 1920s, and this served as the basis for the Stephen Sondheim 2008 musical, “Road Show”. 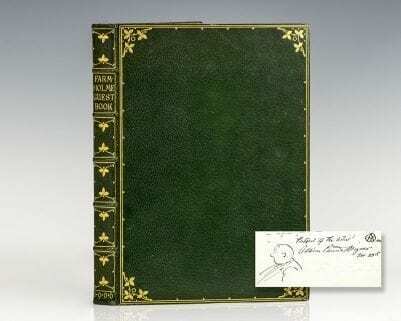 It is the social animal that Mizner was, someone who was able to exploit social connections, that should give this guest book a certain resonance to those fascinated by him and his career. Also, Mizner was a somewhat unconventionally trained architect. He didn’t go to a modern sort of architecture school, but apprenticed in an architectural office, and perhaps it was unorthodox training that later made him so much an original, and eccentric, architect, famous for glitches in his designs such as stairways that went nowhere. But he was regarded as a highly proficient draftsman and talented artist, abilities perhaps all too in short supply in the architectural profession, and here are examples of his quick dash art that provide some delightful corroboration of this reputation. Another guest at Farmholme was Ethel Watts Mumford (Grant), his co-author, who in one place contributed four lines of comic verse and a drawing of two monkeys. Other guests included Elisabeth Marbury, the prominent theatrical agent and lesbian lover of Elsie de Wolfe; Mary Livingston Hunt, of the Old Knickerbocker Livingstons; and many others who were undoubtedly secure in their Social Register bona fides — people with names such as de Forest, Alsop, Callander, Ogden, Hotchkiss. Whoever many of these people were, the same people came back again and again over the two decades, suggesting a close knit group of friends. While many of the entries are just autographs, sometimes accompanied by an anodyne sentiment, not a few are accompanied with a few lines of appreciative verse or snippets of musical notation. One guest, an Eduardo Bucco left several entries in Italian verse. The painter of the watercolor cameo signed in reverse — one needs a mirror to make out the name, which looks something like Raymond Tumball. As august as Farmholme must have been, based on its guests, bits and pieces hinted at in the text of entries, the painted view, the exquisiteness of the guest book itself, we were not able to discover anything definitive about the estate. 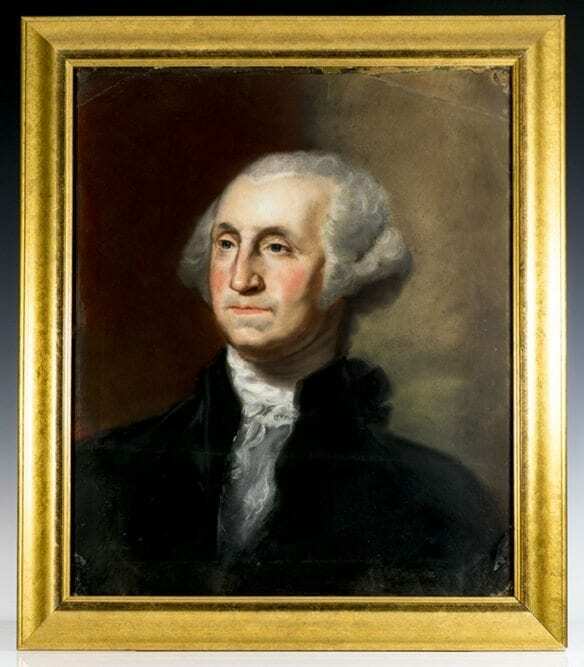 Portrait of George Washington, executed and signed by artist Nicholas Alden Brooks, 1840-1909. Pastel on paper. The portrait measures 21 inches by 25 inches. Framed, the entire piece measures In very good condition with light rubbing. Framed behind glass. The entire piece measures 25.5 inches by 30 inches.